What is holding up a deal on EU reform? Jump to media player The pro and anti-European Union camps in the UK are already gearing up for a referendum campaign, as the BBC's Iain Watson reports. Tusk: Some progress made in EU talks Jump to media player European Council President Donald Tusk has said "some progress" has been made during talks on EU reforms. UK government in EU referendum climbdown Jump to media player The government is to change its planned rules on campaigning in the UK's in-out EU referendum after criticism from Eurosceptic Conservative MPs. Which countries can Cameron count on? Jump to media player Katya Adler looks at what support UK Prime Minister David Cameron has for his reforms. The 28 European Union leaders have finally agreed a deal, re-writing the terms of Britain's membership, after extending their summit in Brussels into a second evening. 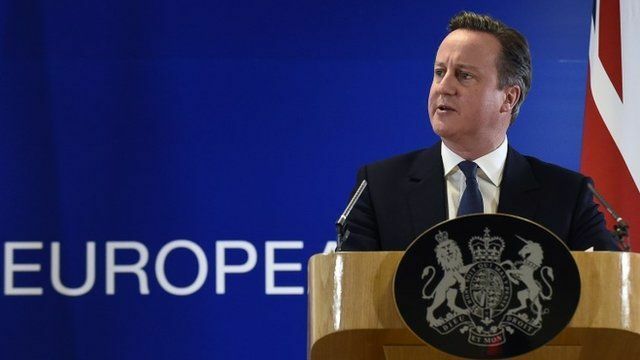 At a news conference David Cameron said he had "delivered on the commitments" he made at the start of the process. Go to next video: What is holding up a deal on EU reform?